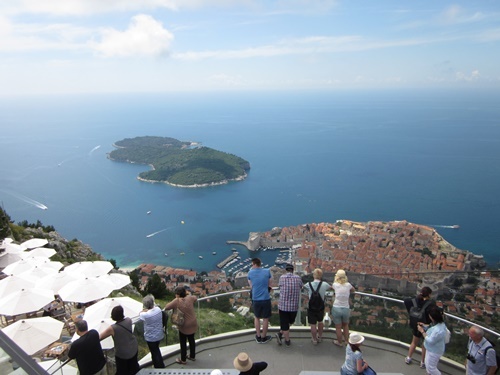 Dubrovnik cable car is among top tourist attractions in Dubrovnik and great way of exploring Dubrovnik region. The embarkation point for the Cable car can be reached in five minute's walk from the Old Town. From Stradun take Boskoviceva street all way up, which leads towards the exit of the Old Town. Take the stairs up, walk next to fireman station, cross the road to the right. Cable car station is located only 100 metres further. For cruise passengers arriving from Gruz port the easiest way is to take city bus no.8 from main bus station (next to cruise terminal) which will drop you exactly at the spot. For guests staying in Babin Kuk or Lapad the best option is to take city bus no.5 which will drop you right at the cable car station. It is possible to drive or take a taxi to the top of Mount Srdj if you are short of time. You can also walk up the hill if you like but the path is very demanding and exposed to the sun. To walk up you should start from Jadranska cesta near "Welcome to Dubrovnik" sign. Another great option is to take a tour that includes transport, a local guide and a visit to the Old Town. The cable cars start running at 9 a.m. and run every half hour until midnight in the summer, stopping earlier in the off-season. It is possible to buy tickets via Viator or Getyourguide web sites or on the spot at the cable car station. In only three minutes you will find yourself at a height of 405 m above sea level from where you can enjoy a panoramic views of Dubrovnik and the Adriatic sea.